Two sliding glass doors act as a display window for all your fine dinnerware. Two shelves allow you to safely store and effectively showcase your favorite dinner pieces. 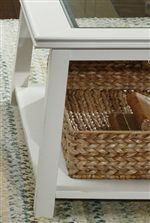 Four felt-lined drawers are the perfect storage for silverware, delicate dishes, and table linens. Burnished pewter door pulls and a cottage finish create a transitional juxtaposition with the cabinet's clean lines, tapered feet, and subtle moulding. This piece is great for smaller kitchens or dining spaces when there just isn't room for a large-scale china cabinet. The Summerhill Sliding Door China Display Cabinet by Liberty Furniture at Furniture Discount Warehouse TM in the Crystal Lake, Cary, Algonquin area. Product availability may vary. Contact us for the most current availability on this product. Bring a rustic and warm appeal to your home with the Summerhill collection. Featuring solidly constructed wood bases, these pieces embody a cottage-like styling with modern construction. This group is sleek and smart in design. Add warm fashion to your living and dining room today with the Summerhill collection. The Summerhill collection is a great option if you are looking for Cottage furniture in the Crystal Lake, Cary, Algonquin area. Browse other items in the Summerhill collection from Furniture Discount Warehouse TM in the Crystal Lake, Cary, Algonquin area.